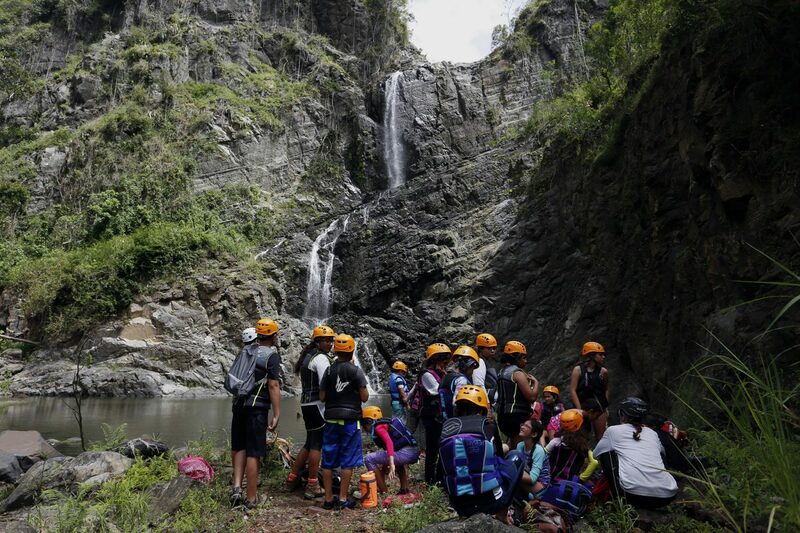 On June 2018, Para la Naturaleza (PLN) welcomed the first group of participants to participate in the Immersion Workshop at San Cristóbal Canyon in Barranquitas. Thanks to the support of Save The Children, 21 boys and girls ages 9 to 12 years old were officially the pioneers of the five-day camping workshop which was held on the grounds of the Canyon’s visitor center. The young environmental stewards learned about the history of the protected natural area, planted 80 endemic trees in the lower part of the Canyon and learned about the interconnectivity that exists between the ecosystems of the mountains and the coast. The participants also explored the nightlife of the central mountain range and traveled to Hacienda Esperanza where they sailed the Grande de Manatí River by kayak. In fact, this was one of the activities that the participants enjoyed the most. "What I liked the most was to kayak because I did not know how to do it. Nor had I ever gone to the bottom of the Canyon. I thought that the Canyon was not going to be so entertaining, but it was. We saw a lot of animals. We saw a San Pedrito bird, a Puerto Rican lizard and a golden spider ball,” said one of the workshop participants, Ángel Nuñez. Another leader, 14 year old Arion Ponce confessed, “Although I've been taking Para Nature workshops since I was little, I've been a leader for only two years. I remember that I wanted to be a leader since I entered the workshop as a participant.” Parents were equally emotional and moved to see their children become so attached to nature that it left tears of happiness in some of them. One parent, Grisely Torres enrolled her son Diego Vázquez Torres because he would have a direct connection with nature and he would be able to learn leadership skills. “What we want is for them to be leaders, to be environmentalists and to love nature. I see him so happy that I can even see the sparkle in his eyes from being in the workshop,” Torres said. For Fernando Lloveras San Miguel, president of Para la Naturaleza, this Immersion Workshop is central to the mission of the organization and rewarding for each of the participants, leaders, parents and professionals who are part of it. In addition to the knowledge acquired by children, the leadership they develop is transformative. "These workshops have the ability to immerse children in nature for five days, without anything electronic, just using all their senses to know their real environment. The result is what we are seeing right now - that they are observing everything and learning the exact names of the species of trees, insects and birds. This was previously foreign to their reality...this workshop has great contributions, one of which is that these children emerge as leaders and manage to create relationships that they did not have before," explained Lloveras San Miguel. It’s been 25 years since conservationists came together to develop a workshop for children from different parts of the island to integrate learning and connections directly with nature. Given PLN’s access to natural protected areas, the idea and framework for the Immersion Workshops was born. Esther Díaz is the only remaining member at PLN who was part the team of experts that helped create the workshop. In fact, the love they have for Esther is so much so that for everyone who has been part of the Immersion Workshop refers to her as "the official guru of the leaders". "She is one of the people who has the ability to know which child has the potential to be a leader in the future. She is always aware of what needs improvement, correcting and how to translate and teach children so that they are able to understand terminology. All of her constructive feedback helps to train the leaders. She is the best and is like a mother to us," said Jean Carlos Díaz, workshop leader. During the closing of the workshop, Esther’s work was honored and she was given an emotional postcard that featured a “life line” of each of the leaders that give life to the Immersion Workshop. PLN’s Immersion Workshop was made possible thanks to the support of Save The Children. Save the Children is a leading independent worldwide organization working in favor of children. Since its founding in 1919, Save the Children has transformed the world for children. Through their work in the field, with communities and with governments, they have helped define and ensure that the promises that the world makes to children are fulfilled, since the first Declaration of the Rights of the Child, of 1924, drafted by its founder, Eglantyne Jebb, until the United Nations Convention on the Rights of the Child of 1989. Save the Children is part of a movement that has the unique opportunity to prevent children from dying from avoidable causes, from not enjoying a quality education and from living exposed to poverty, violence or emergencies.